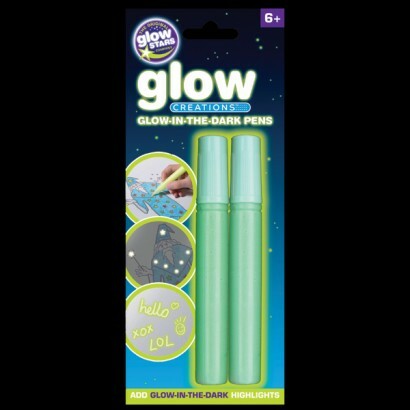 Create fabulous artwork that glows in the dark with Glow in the Dark Pens. Draw your image or write a secret message, expose it to light for a couple of minutes and then when you turn out the lights, your message or artwork glows!!! Fabulous for inspiring creativity especially around Halloween. Note: Please allow glow in the dark ink to dry overnight. WARNING: Glow in the dark ink does not wash out. Please wear old clothes and protect all surfaces. Not really pens - the glow substance is more like wood glue which you squeeze from the tube 'pen'. A lot of this 'glue' gets stuck inside the tube/pen. The glow effect is quite good though, but if you use enough to create a good glow the glue doesn't go transparent and is a visible whitish colour in daylight. Perhaps better value if you just buy paint, although Glow In The Dark Paint is also expensive.